Description: Located in, of course, Miami, Miami Trailer is South Florida’s largest Food Truck and Concession Dealer, offering their units to businesses across the US (as a Minnesota native, this blog writer even spotted our own prized WSK in their listings!). We have over 15 years experience in the Food Truck industry, and hold a large stock of Completed and To-Be-Completed Concession Trucks and Trailers on hand for our customers’ needs. This is done by buying large fleets of food trucks at a time and converting them by hand from scratch to custom food trucks, making sure that each one is unique. Thus we have a variety of options from Mobile Kitchens, Carts, Ice Cream Trucks, BBQ/Smoker Trucks/Trailers, and Coffee Trucks We offer a clean, modern and attractive Custom Wrap job on every truck we sell to meet the design of your dreams. 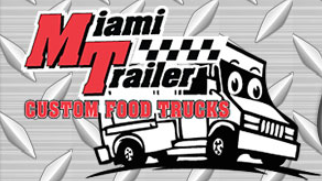 Contact us to leave your own experience working with Miami Trailer.